And Ciara and Nicki Minaj's 'I'm Out' - I know, I'm embarrassed to reveal this here, but by god, I've played it a lot in the past week. On the radio today I'll be talking about Beautiful Creatures at the Adam Art Gallery, the seeming announcement that Amazon is launching an art gallery, and an interesting NPR article on the museum building culture in China. Twitter is a self-curated world of choose-your-own-adventure voyeurism. It becomes interesting when you realize that you can just sit behind the scenes of someone’s life and listen to them talk to themselves, when you realize how many inner monologues — those of friends, celebrities, strangers — are waiting there naked-faced in a neat backward scroll. Voyeurism is not widely acknowledged as useful, and social media are constantly being asked to justify their efficacy. Although Twitter succeeds as a mechanism for self-promotion and offers a way to connect with strangers or friends of friends, its main utility is as entertainment. We have all wished at times that we could be there for someone else’s argument, gossip session, or first date: Twitter gets us pretty close. Twitter is where we go to be creepy, and #followateen demonstrates this: It is precisely what has made Twitter so popular, so successful, and so addictive. It's not exactly inner monologue though, is it? Anything that looks like this is usually a carefully crafted public interface to a private thought or moment. Sure, people might exist who appear to have no filter - but then, they're the same people who have no filter in face to face conversations. I think I happened upon that article (my first introduction to the meme, which had thankfully not been picked up by the 200-ish people I follow) on the same day that I found Scientific American's coverage of anthropologist Andrew Irving's attempts to capture the inner monologue of New York pedestrians. He does this by approaching people in the street, miking them up, then following them with a camera as they walk and talk. How this can really be anything other than performative, I don't know. This is the same 'inner monologue' as one gives on Twitter: revealing, yet in a controlled, edited, publishable manner. The risks you take are the ones you have chosen. New York's Museum of Arts and Design (MAD) is this weekend running an event called Museum as Plinth: Take One, Leave One. 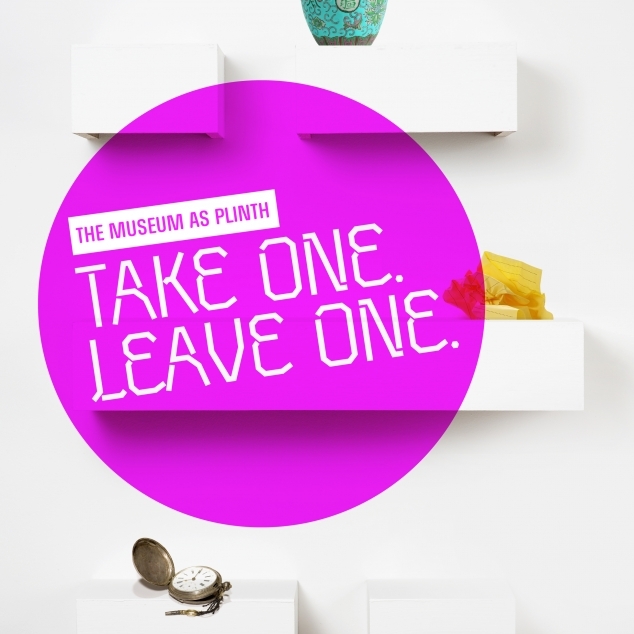 On May 28 and 29, the Museum will install a "take and leave" shelf of objects in its lobby. Visitors will be invited to exchange an object for their own for one from the shelf. Each object on the shelf is given a "From the Collection of the MAD Museum" and, MAD says, "in effect, admitted to the museum's collection." The event seeks to ask questions about how design is identified, valued, and treated in the museum context, and will be documented in an online catalogue and through a blog and social media. The only thing that would make this better would be if one - just one - of the objects left on the shelf came from the MAD's collection. One secret sacrifice and unknown gift for a giver. A lengthy, dreamy, precise and visceral mediation on the nature of collections, and collections of nature: Matthew Battle's 'Specimens'. Make a cup of something you like and settle in. From the occasional reviews department: Aaron Belz's Lovely, Raspberry. But I never hear back. labeled "I hate my life." 1. Why did the elk, deer, chipmunks, coyote, sea stars, orca whale, sealions, newt, weasel, and many different kinds of birds cross the street? 2. Elk, deer, chipmunks, coyote, sea stars, an orca whale, sea lions, a newt, a weasel, and many different kinds of birds walked into a bar. 3. How many elk, deer, chipmunks, coyote, sea stars, orca whale, sea lions, newts, weasels, and many different kinds of birds does it take to change a lightbulb? 4. Elk, deer, chipmunks, coyote, sea stars, an orca whale, sea lions, a newt, a weasel, and many different kinds of birds were entering heaven, and St. Peter stopped them to ask a question. 5. What do you call elk, deer, chipmunks, coyote, sea stars, an orca whale, sea lions, a newt, a weasel, and many different kinds of birds at a party? sometimes and went out on the town. I called her my Chiquita. All in good fun. make our relationship official. We decided no. of just being friends with banana outfits. I have two kinds of things, she says. and things that I have only one of. where do the circles overlap? there is a third kind of thing. have more than one ornithography. But occasionally Aaron Belz will write a long poem, with a complicated layout, full of tabs, and little narrative, and no funny bits (or no bits that I feel confident laughing at, in case he was trying to be serious, because he's tired of being thought of as that guy who writes funny observational poems, and couldn't people for once see that he has something to say, like, an important view on the world?). And I'll read those ones dutifully, but I won't be able to tell him that I didn't like them, because I didn't get them. Instead, I'll try to distract him by saying, "Hey, Aaron? What about that wand one? I really like the wand one. Read it to me again." And I freely admit to having three versions of 'Say My Name' on my running playlist. Drake's 'Girls Love Beyonce' is the latest. This morning on Twitter I followed an American Federation of the Arts panel discussion being held at MOMA about blockbuster exhibitions. Often I find following talks on Twitter frustrating, but this was remarkably well live tweeted. I've pulled together the threads of the conversation below, and inserted a couple of other articles that sprang to mind as well. There's a point towards the end that I find really interesting right now: how do we balance the needs, and enhance the experience, of 'silent' and 'social' visitors? As I write, I'm listening to the music of the spheres. This is nothing new (the notion of the music of the spheres, that is - me listening to it is unusual) but Whitevinyl's (aka Luke Twyman) delicate and simple version has really touched me. I stumbled across this when someone on Twitter linked to the lovely Here is Today and I started picking through Twyman's back catalogue. The night before this happened, I'd been having a good whine to a friend. * "I feel like the angry old lady of the internet," I told him. "I'm starting to hate it all. Especially visualisations. And 3D printing. And interactive tables. Most of all, interactive tables." And then along came a visualisation that cut me off at the knees. It gets me because it mimics, exactly, how I follow along if I am intensely engaged when someone is explaining something to me. They'll give me a concept. I'll nod. I'll look down at my hands, maybe draw a little pattern on the table-top. And then I'll say Okay. Okay. Give me the next bit. Hit me with it. Okay. Hit me. Okay. Okay. And with that, the whine was over. *It was markedly unfair to be whining on this topic to this particular friend, as he supplies me with a considerable amount of the wonder I come across. From that 2011 list, a few still stand tall. For example. you can't go wrong with Philip Pullman's 'His Dark Materials' (Northern Lights, The Subtle Knife, The Amber Spyglass) and Patrick Ness's 'Chaos Walking' - The Knife of Never Letting Go, The Ask and the Answer, Monsters of Men. And I continue to press Rebecca's Stead When You Reach Me on everyone I can. Likewise, Terry Pratchett's Tiffany Aching series remains high in my regard. They are sweet, funny, wise books that teach you how to live strongly and well. Since then I have read some very good books to add to the list. Mal Peet's Life: An Exploded Diagram does amazing things with time and perspective. I fell for John Green's The Fault in Our Stars, despite its Titanic-like purposeful heartstring twisting. Maggie Stiefvater's The Scorpio Races is not great, but it's eminently readable and I like that, in opposition to the Green, it doesn't set out to play your heart like a fiddle. Lev Grossman's Magician King series is more like a homage to all things YA than YA itself. The first book is hipsterishly funny whilst also being a love letter to C.S. Lewis and (my god amongst writers) T.H. White; the second starts to dribble on a bit. Two books I highly, highly recommend though: Margo Lanagan's beautiful dark twisted romance Tender Morsels and Karen Thompson Walker's quiet, almost mundane dystopian fantasy The Age of Miracles. And I have a dreadful feeling that I left Meg Rosoffs' How I Live Now off that original list. I think it's a masterpiece. Her There Is No Dog is not as good, but still a blast. And to go back in time. If you have reached adulthood without reading Richard Adam's Watership Down, Dodie Smith's I Capture The Castle and T.H. White's The Once and Future King, then shame on you. Fix that fast. Astral and poetic though it may be, the restrictive labels of genre serve more to pigeonhole than categorize an album of this magnitude and thought. The cordial clatter of festival drum machines embraces the listener in the clement grasp of a hypnagogic summer. Violins emerge from the ether en masse like fireflies, filling the air with phosphorescent flecks of alternating melancholy and joy. Nothing else on Ultramarine matches the wilting splendor so carefully cultivated on “New Summer,” though gems abound. Unabashedly resplendent with Balearic synths and a sing-along chorus set to a captivating calypso cadence, “Fall For You” abandons all hinting toward a tropical ambiance and embodies the paradise that lies beyond the celestial halo. “Come sleepwalk with me,” she beckons, and with that she whisks you away to a sparkling synthetic azure. I am such a sucker for the American sports myth. I died a little death over most episodes of Friday Night Lights, and I wept over the original book. I inhaled books that unpick the mythologies. I recently fell in love with the Mike Schwartz, the burly, bearlike retaining wall of Chad Harbach's The Art of Fielding. They need a kid who will confidently stare another person in the eye, whether he's a coach on a recruiting visit or an acclaimed professor in class or a USC linebacker across the line of scrimmage or whatever comes later in life. "I tell these guys all the time, the same mentality you take into a football game, you're going to take into a board meeting," Shaw said. "When you're the CEO of whatever company, you are going to walk into that board meeting with the same mentality we walk out onto the football field with." What they're offering is a chance for kids to find other kids like themselves: the almost insane 1%, the academically, physically and socially talented. Having recently finished Sheryl Sandberg's Lean In, I'd love to know if there are coaches of women's sports doing the same thing. *And, it turns out my Roomba vs 3D printer dream. It lives!